← Tackling Environmental Justice: a Local Perspective. Tackling Environmental Justice: a Global Perspective. This statement needs to be analyzed carefully, because it holds the key to offering a solution. A year ago (last October) the World population surpassed 7 billion; when I was born in 1939, the world population was about 2 billion. The median UN estimate for 2050 predicts a global population of 9.2 billion, with about 85% of the people residing in what we identify now as developing and less developed countries (this includes China, as singled out by Governor Romney) (Science 333, 540 (2011)). Here are the 2008 relevant data for China and the US: Carbon Dioxide emissions (in thousands metric tons) – China – 7.031 million; US – 5.461 million; Carbon Dioxide per person (in metric tons) – China 5.3; US – 18; GDP (in current US $) – China – 4.5 trillion; US – 14.2 trillion; GDP per person (US $) – China – 3,414; US – 46,760; GDP growth (in %) – China – 9.6; US – (- 0.4). I chose 2008, because this was the latest year that World Bank data was available for all the indicators that I chose to post here (I realize that 2008 was the start of a financial crisis in the US and other countries, but not in China). Almost all of the future scenarios for climate change make separate estimates of the indicators in this equation. The difference factor of 15 in GDP/Person (measure of affluence), between the average Chinese and average American makes it clear that the Chinese and the rest of the developing world will do everything they can to try to “even the score” with the developed world. The global challenge is how to do this while at the same time minimizing the environmental impact. 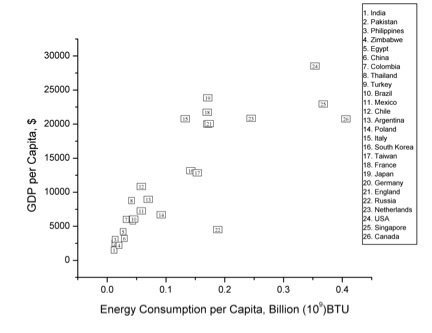 The figure below, taken from my book, shows the dependence of the GDP/Person on Energy Use/Person for 26 countries, including both developing and developed countries. The data for this graph were taken from the 2002 CIA World Factbook. On superficial observation, the dependence in the graph looks linear. Linear dependence indicates that the energy intensity, defined as the ratio of GDP/Energy Use, is constant and independent of the GDP of a country. The energy intensity is a true measure of the efficiency of energy use. The approximate independence of the energy intensity to GDP, directly contradicts the often-heard perception that developed countries use their energy more efficiently than developing countries. More careful observation shows (Yevgeniy Ostrovskiy, Michael Cheng and Micha Tomkiewicz; “Intensive and Extensive Parametrization of Energy Use and Income in US States and in Global Environments”; International Conference on Climate Change: Impacts and Responses; 12 – 13 July 2012; Seattle Washington) that the energy intensity is weakly dependent on the GDP (inverse square root dependence), not because developed countries are more efficient in their use of energy, but because service starts to play bigger and bigger roles in developed countries and is considerably less energy dependent as compared to heavy industry. In the next few blogs I will focus on the difficulties in reaching an international agreement on limiting the use of fossil fuel, what China and other developing countries are doing to change their energy use, and how the USA is reacting to these developments. This entry was posted in Climate Change and tagged China, Climate Change, Energy, Environmental Justice, Fossil Fuels, Global Population, Global Warming, IPAT, Romney, Science, ScienceDebate. Bookmark the permalink. 6 Responses to Tackling Environmental Justice: a Global Perspective. I am not rattling good with English but I get hold this rattling easygoing to understand. 3)no way that china/india/brazil-S. America/Africa will even come close to even Euro fossil carbon loading per capita. It is naive to imagine that the central planners in New Delhi or Beijing are unaware that half of Bangladesh will be gone in less than a human lifetime, or that Mongolia will have a coastline in three. Their polity are not insane, rather, very shrewd, and rooted in long, long history, a history which has seen vast environmental slaughter, and they reap every day the consequence. They will work harder than any in the West to end it. They will prove wiser than the Occident in rejection of fossil carbon emisson. After all, even the lowest street people of Beijing or Bombay breathe the same air, suffer the same storms and the same floods, live on the same earth under the same sky, as their overlords. In contrast, it sometimes seems that the lords of the west do not live in the same world as their serfs.